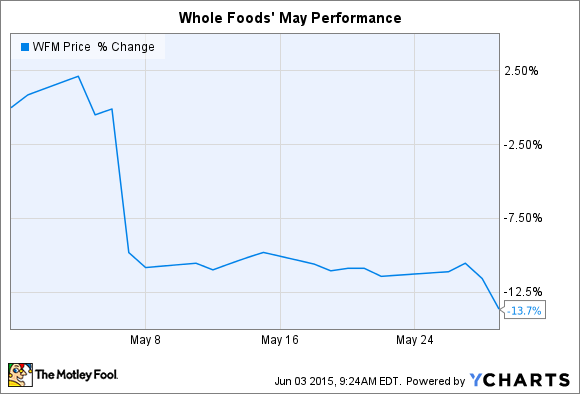 What: The stock of organic and natural-foods grocer Whole Foods (NASDAQ:WFM) fell 14% in May, according to S&P Capital IQ data. Shares are now much closer to the 52-week low of $36 per share set last summer than the high of $57 reached in mid-February. So what: Last month's dip was caused by a fiscal-second-quarter earnings announcement that failed to meet Wall Street's expectations. Whole Foods increased comparable-store sales by just 3%, which suggests it is continuing to feel pressure from rivals such as Kroger (NYSE:KR) and Costco (NASDAQ:COST), which are using low prices to grab market share in the organic and natural foods-sector. That competition threatens to put a lid on Whole Foods' sales growth opportunities while lowering profitability. Indeed, the retailer's gross profit margin slipped slightly to below 36%. While that's far above Kroger's 21% and Costco's 13%, the profit gap highlights how hard it would be for Whole Foods to compete against these companies on price alone. Kroger and Costco both take a "no frills" approach to grocery retailing, while Whole Foods' stated mission is to "transform food shopping from a chore into a dynamic experience." Now what: That structural mismatch is likely a key reason why Whole Foods' management last month outlined plans for an entirely new store concept, one with a lighter expense profile better designed to meet the challenge posed by low-cost rivals. "Offering our industry-leading standards at value prices, this new format will feature a modern, streamlined design, innovative technology and a curated selection," said co-CEO Walter Robb in the earnings press release. "It will deliver a convenient, transparent, and values-oriented experience geared toward millennial shoppers, while appealing to anyone looking for high-quality fresh food at great prices." Management also told investors to expect a "rapid expansion" of the concept after it launches sometime next year.